At Everbowl, they believe that eating right can be both good and good for you. Their mission is to un-evolve food. That means getting back to the basics of delicious food that is uncomplicated, made from stuff that grows in the earth and nourishes the body. 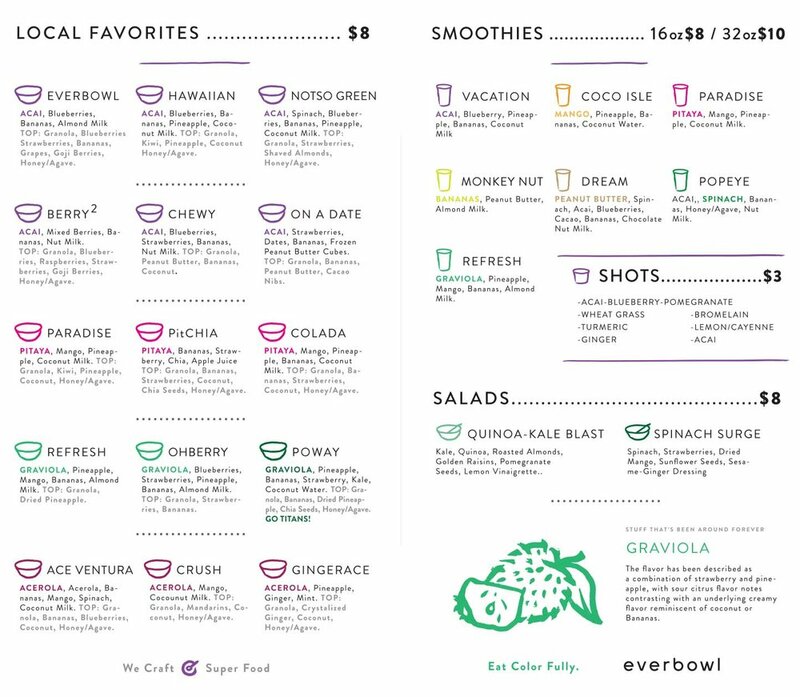 Everbowl’s robust menu of smoothie and acai bowls are crafted to order for every customer. They have two locations open in North County (San Marcos and Poway) and two more opening soon. Everbowl is the brain child of entrepreneur Jeff Fenster. He is a San Diego native, a father of two, and on a mission to help jumpstart others towards a healthier lifestyle that includes accessible, affordable and nutritious food. “Everbowl is for everybody,” tells Jeff. Jeff has always had an entrepreneurial spirit; Starting his own payroll company at the age of 24. He went on to lead a digital marketing agency to success. Jeff’s current and true passion is helping others make healthier choices with their food, one Everbowl at a time. Everbowl’s Poway location opened in October of 2016 and then came San Marcos. Jeff tells Your North County that he hopes to open three more locations by the end of the year. Everbowl is also highly involved in the community. They give to charities and support community events that focus on movement and a healthy lifestyle. The cornerstone of the superfood smoothie bowl is the antioxidant-rich fruit that is blended to perfection inside every Everbowl. 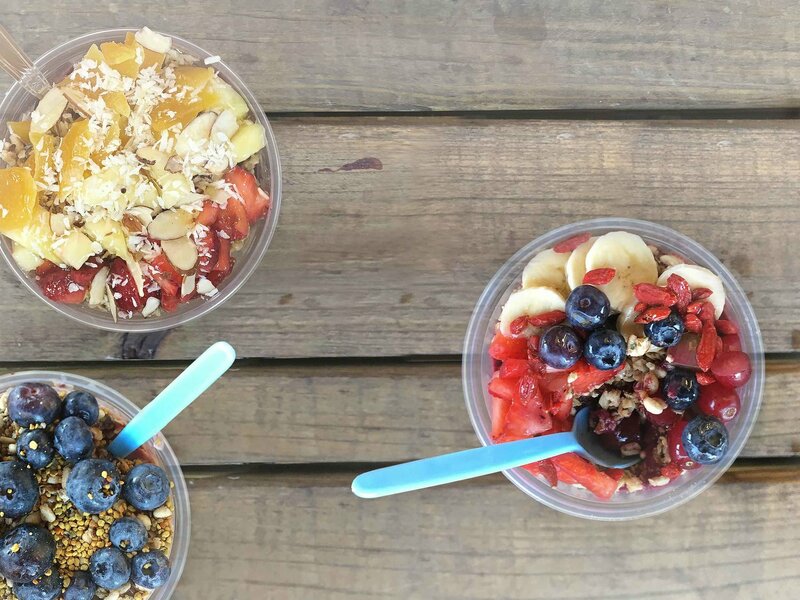 There are four fruits to choose from at Everbowl: Açai, Pitaya, Acerola, and Graviola. Açai (pronounce ah-sigh-ee) is a tart brazilian fruit that has become wildly popular among the health-conscious due to it’s powerful antioxidant properties (10 times what is in red grapes) and low sugar content. Pitaya (pronounced pit-eye-uh) also known occasionally as dragon fruit, has a high antioxidant score and grows on select cacti that are indigenous to the Americas. Acerola is a fruit native to the West Indies that contains an extremely high amount of Vitamin C. One Acerola fruit contains 134% of the daily recommended dose of vitamin C. Acerola has been grown throughout northern South America and in Southern California. Graviola is a green heart-shaped fruit with a prickly skin natively grown in South America. It has an even higher vitamin C content than Acerola. It’s also extremely high in fiber, potassium, iron, vitamin B-6, and magnesium. There are two ways to eat an Everbowl Superfood bowl. You can choose a “Whatever Bowl” (a crafted to order smoothie bowl) or select one of the “Local Favorites” recipes. If you choose the Whatever Bowl, it starts with your choice of one of the base super fruits we mentioned above. After you’ve selected your base, choose your non-dairy liquids to blend in. Liquid choices include a variety of options like cashew and almond milk as well as coconut water and coconut milk. Finally, choose more superfood add-ins and toppings like goji berries, bananas, strawberries, pineapple, bee pollen, hemp seeds, chia, agave, and so much more! If you can dream it, Everbowl can create it. Want Everbowl to take the guess work out of choosing? The Local Favorites selection of their menu is inventive and mouth-wateringly good. The classic Everbowl Local Favorite is a traditional açai smoothie bowl with a twist of ingredients including goji berries, grapes, and honey/agave. Want something a little more decadent? Go for the On A Date Local Favorite. It’s got açai, strawberries, dates blended together with frozen peanut butter cubes and topped with bananas, granola, peanut butter and cacao nibs. They had us at frozen peanut butter cubes. In total, there are 15 different Local Favorite choices, so you will always have something delicious, fresh and tasty to choose from. Other menu items include 7 different fresh fruit non-dairy smoothies, 2 whole food salad options and detox shots of lemon-cayenne. They also serve up “ever oats,” which is Everbowl’s spin on overnight oats. It’s available in the grab n’ go section. In the winter, they do hot soups that are packed with nutrition. Feel like splitting a superfood bowl with a friend? You can do that too. Just order your choice of bowl and ask for it to be “split”. They will split into two separate smaller bowls. Pet lovers rejoice! Everbowl is dog-friendly and even provides your best pal with a complimentary dog bone cookie and water bowl. As an associate for details. Those who are living dairy-free can feel confident that every menu item is dairy free, but not lacking in flavor. No extra charge for toppings – $8 for 24 ounces with unlimited choice of toppings. Basically, whatever can fit in the large cup. Trust us, it’s a lot. Every super fruit base is organic and whole food, with no added sugar. Everbowl wants to make every customer who walks through their doors feel like a friend. They seek to provide their guests with the friendliest and most attentive customer service possible. Just good food and good company. Mon – Fri: 7:00 a.m. – 8:00 p.m.
Saturday 8:00 a.m. – 8:00 p.m.
Have you been to Everbowl? Comment below to let us know!